Significantly more adults who ate the recommended daily amount of fruits and vegetables reported better brain health than those that did not. Most adults, however, are not getting the daily recommended servings in all five food groups. Moreover, one-third did not consume the recommended amount in any food group. Nearly nine in 10 adults said they are likely to eat healthier if they knew it would lower the risks of cognitive decline (87%), heart disease (88%), and diabetes (88%). More than 60% of adults age 40 and older said that they would eat more fish, less red meat, and lower their dairy fat intake if they knew it was good for their brain health. Adults ages 40-54 were significantly more likely to cite barriers to healthy eating compared to adults ages 65 and older. 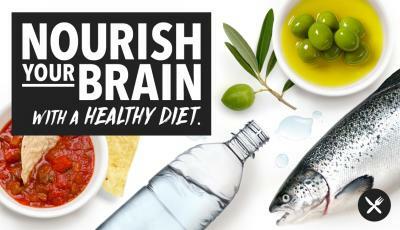 Long-term healthy eating habits promote good brain health, according to new consensus recommendations released separately today by the GCBH. The new report finds that a plant-based diet rich in fruits and vegetables is associated with better brain health, and eating fish and other seafood seems to benefit cognitive function. However, excessive alcohol, high levels of saturated fats, and high salt intake are all harmful to brain health. A heart-healthy diet is also a brain-healthy diet because high blood pressure, high cholesterol, and diabetes—all common conditions influenced by diet—harm both cardiovascular and cognitive health. And contrary to recent reports, GCBH recommends a healthy portion of skepticism for people who are drinking coffee, tea, and red wine expecting a brain health benefit until more evidence is developed. The 2017 AARP Brain Health and Nutrition survey was fielded October 25-November 8, 2017. Data were collected using GfK’s online probability-based panel. The final, nationally representative sample included 2,033 adults age 40 and older. The final sample was augmented to include a minimum of 350 African Americans, 350 Hispanics/Latinos, and 200 Asians. The margin of error for the general population is ± 2.7 percentage points.